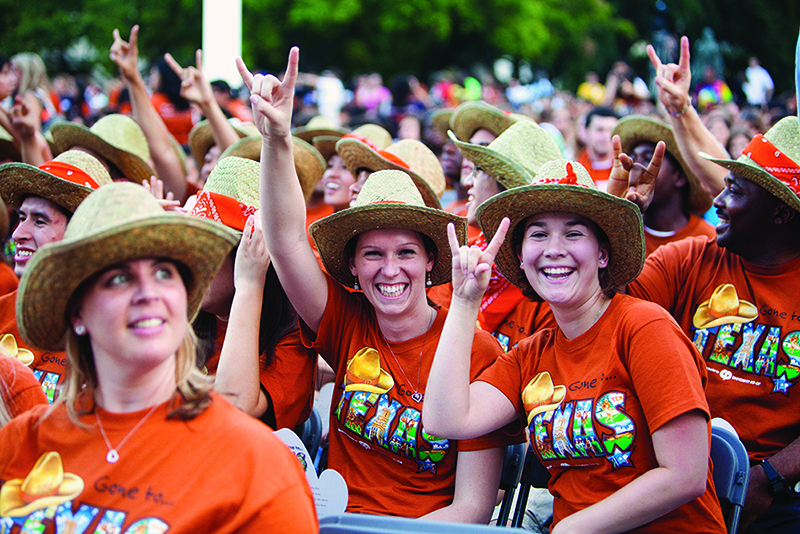 From welcome events to interest groups to personalized advising, the Cockrell School and UT Austin welcome new students with open arms. We'll help you get acquainted with your fellow engineering students, get to know the campus and your new home in Austin, ease the transition into college life, ensure academic success and make your first year an overall rewarding and exciting experience. We encourage first-year students to participate in the programs offered across the Forty Acres. Held every year the night before the first day of the fall semester, Gone to Engineering is a celebration of new students and the beginning of a new academic year. The Cockrell School event features speakers, dinner and a student organization fair to learn about the 80+ engineering groups you can join. Following Gone to Engineering, the entire group of new Texas Engineering students walk to the UT Tower to participate in Gone to Texas, a massive celebration to mark the beginning of life as a Longhorn with a showcase of the university’s spirit and traditions. First-Year Interest Groups (FIGs) are a great way to meet other new students, take classes and study together and participate in group activities. FIGs are organized around a theme or an academic area such as major or program. Students sign up for FIGs during New Student Orientation. With more than 80 student organizations, you will find an outlet for every engineering interest and a community of peers from every background. Hundreds of Texas Engineering students join one or more groups, where you will make new connections, discover and develop your individual skills and abilities, learn from your fellow students and interact with alumni and corporate representatives. To help prepare you for your first year, academic advisors in Engineering Student Services as well as in each of the Cockrell School's academic departments are available by appointment or during walk-in hours. Advisors can help you register for classes, plan your classes for future semesters and give you suggestions for how to enhance your academic experience through tutoring, mentoring, FIGs and other programs. The Forty Acres is filled with locations and offerings that span arts and culture and health and wellness. Fitness centers, art museums, dining halls and cafes, health services and safety services — the campus resources available to students are endless. As a new student, we encourage you to explore all areas of UT Austin to know what's available to you and how you can take advantage of the amazing offerings across campus. There's a reason — multiple reasons — why Austin is consistently named at the top of best-city lists. There are the obvious standout qualities: a sunny, temperate climate year-round; a music, arts and culture scene that's ever-changing; and its position as a major technology hub with a thriving economy and job market. And then there are the extra qualities that make Austin special: an open-minded spirit that welcomes all; the natural beauty built into the city; and no shortage of festivals, events and activities happening at all times of year. Students can ride public transportation for free with your UT ID, and with Austin being walkable and bike-friendly, you should get away from campus when you can and experience your new home city.